The Panasonic Lumix TZ30's 14.1-megapixel headline resolution may read as modest when compared to the 16 and 18 megapixels offered by competing long lens models, such as the Sony Cyber-Shot HX20V (18MP), the Nikon Coolpix S9300, Samsung WB850F and Olympus SZ-31MR (16MP each). Fortunately then, that's not all Panasonic's 1/2.3-inch CMOS sensor-sporting model has going for it. Presenting itself as a jack-of-all-trades device, the Panasonic TZ30 not only features a 20x optical zoom with a broad focal range equivalent to an ultra wide 24-480mm on an old 35mm film camera; it also includes a built-in GPS antenna via which the location at which photos were shot is recorded, as do Nikon, Samsung and Sony rivals. Unlike the Canon IXUS 510 HS or the WB850F, it doesn't also boast Wi-Fi connectivity, which would have proved helpful for downloading images on the fly and not having to pack USB cables on your travels. Because of the need to shoehorn a big zoom into a compact chassis, the depth of the TZ30 is slightly broader than competitors with slightly shorter lenses. Also adding depth is a comfortably curved and rubber coated handgrip to one side of the fascia, which recalls the styling of the Panasonic GF5 and its interchangeable lens ilk. Here the lens cannot be changed, but the point is, with such a broad range of framing options with the one lens – from wide angle group portrait and landscape shots to candid close ups from afar – you wouldn't have any desire to swap it. The camera will also still squeeze into a trouser pocket, so it passes the portability test too. All the above being said, one stumbling block here is the cost, which at a manufacturer's suggested £349 is a tad pricey for a pocket camera not bearing a Leica logo. Having said that, street prices for the Panasonic at the time of writing were around the £250 mark, so much more realistic and competitive. 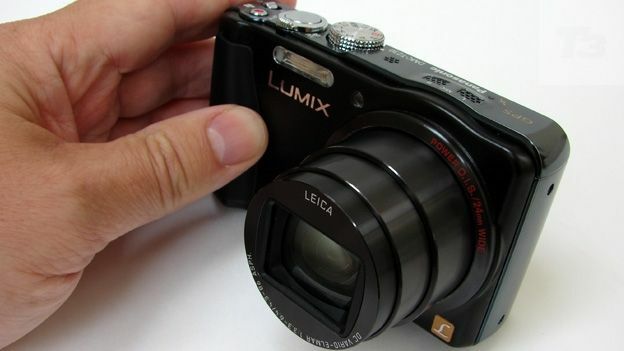 The usual blend of metal and plastic and feeling solid in the palm with no obvious 'give' to the chassis, the Panasonic Lumix DMC-TZ30 features a good smattering of obvious, well-labelled controls. We'd have liked it if the trio of backplate buttons, for controlling exposure, summoning up the Quick Menu which displays the most commonly used settings on the one toolbar, plus the display button, were slightly larger. As it is they require fingertip precision. Falling under the thumb at the back is a small switch for flicking between image capture and playback modes. Though there's a pad of nine tiny raised plastic nodules alongside to prevent the thumb sliding around when shooting with the camera one- handed, it's said switch that prevents slippage. Ramping up the spec is Full HD video with stereo audio. The recording of this is a one touch process via a press of the recessed top plate button, while a small but reassuringly stiff shooting mode dial with manual and custom settings, as well as the usual fully automatic intelligent mode, ensures the right settings get applied whatever your experience level. In short we could point and shoot with the TZ30, but over-ride the camera's choices when we wanted. It's worth noting here that the TZ30's LCD screen is of the touch panel variety, so it can be utilised in tandem with the physical controls described above. There's the ability to fire the shutter by tapping the glass and even control the zoom by sliding a finger across the screen. Rather than using purely physical controls or virtual ones, the mixing-it-up approach seems to work best in providing some useful shortcuts and a faster overall operating experience. Whereas most manufacturers do away with most manual buttons when a touch screen has been implemented, the Panasonic in our opinion offers a best of both worlds approach. The rechargeable DMW-BCG10E lithium ion battery supplied with the TZ30 is good for up to 260 shots from a full charge – satisfactory without being anything special. That said it is a distinct improvement on the 200 or so images managed by the Nikon S9300 or Canon PowerShot 260 HS' own provided cells, but falls a little short of the 320-picture battery life of the identically priced and nigh identically featured Sony Cyber-shot HX20V. Panasonic is making a pitch for the TZ30's auto focus being lightning swift, but in truth we didn't notice it responding any faster than competing brands. A half press of the shutter release button and the screen view very briefly blurs before snapping back into focus, so, while swift enough, it's not quite instantaneous. This being a Panasonic though there is certainly consistency when it comes to image quality, which makes the TZ30 a great option for the point and shoot, or indeed travel photographer. Pictures are universally bright and detail rich straight out of the camera, colours packing plenty of punch whether we're talking video or stills, with very little to find fault with. Performance is consistent and delivery reliable, but we can't help feeling like we've been here plenty of times before with Panasonic. The TZ30 comes across as a playing-safe consolidation of existing models and market share rather than an evolutionary step on. The 14.1 megapixel, 20x optical zoom Panasonic Lumix DMC-TZ30 is the best point and shoot camera it offers in terms of striking the right balance between feature set and performance, before you start stepping up to the likes of the premium-end Panasonic Lumix LX5 and its replacement, or indeed one of the manufacturer's interchangeable lens compacts such as the GF3 or newer GF5. Like its rivals, a folded lens construction means that the camera slots conveniently into a trouser pocket when switched off, and that broad focal range equivalent to a wide angle 24-480mm in old 35mm terms ensures there are plenty of subject framing options at your disposal from the one vantage point when it's switched on. The big zoom but (relatively) small chassis is also the reason why you'll want this as an alterative or supplement to that camera in your smartphone.